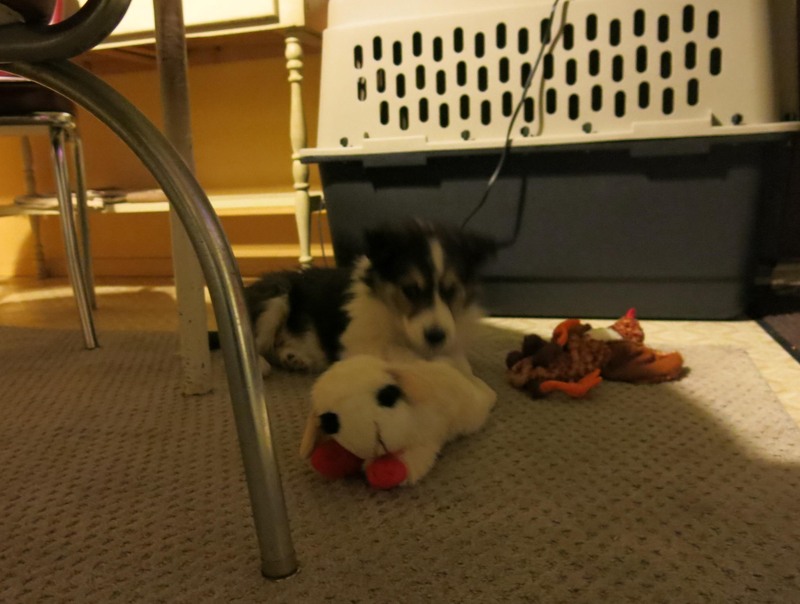 Hi everyone; it is I, Mani the purebred border collie. I forget what I’m supposed to say next. Oh. Thanks for all the comments on my first post. I couldn’t respond to every one, because I’m little, you know. I slept in my portable fort next to the bed upstairs last night, with a night light on. I made the guy who brought me here get up at four o’clock in the morning, which he said was “perfectly okay”, though later he seemed to regret saying that. I had some breakfast, played some with the guy who brought me here, and then discovered that there was a basket of toys in the living room. There was one in particular that I liked a lot, and you can see by the blurriness of the pictures how fast I was enjoying chewing on it. It belonged to Chess, of whom I’ve heard a lot. The chicken next to me is pretty fun too. It makes a honking sound when I chomp on it. When I chomped on the guy who brought me here’s fingers he just laughed. There don’t seem to be very many rules here. I can take naps whenever I want to. The guy who brought me here said he thought maybe he might call me “Keith”, because it looks like I wear eyeliner, which I don’t, but he thought that was really funny. I think he’s just jealous because he can’t take a nap with his tongue sticking out. You have to be fairly advanced to be able to do that. 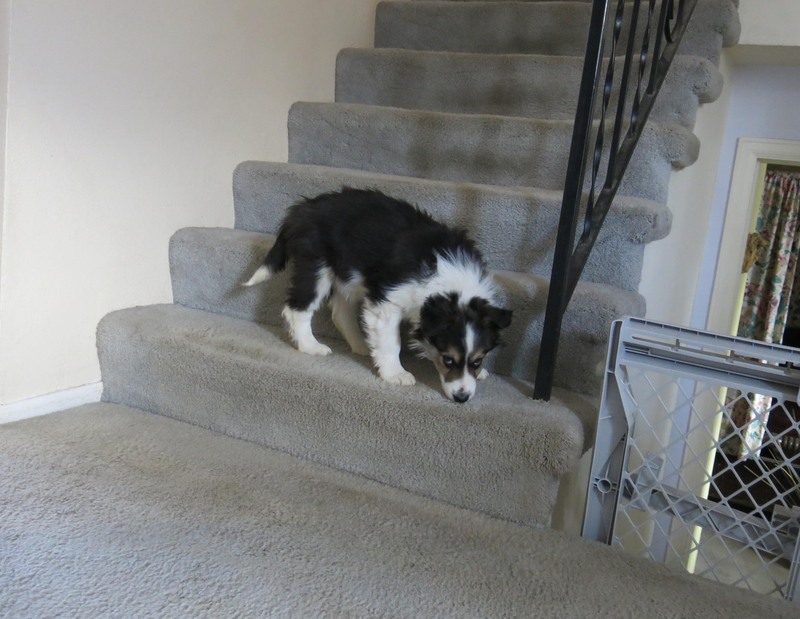 He also thought I didn’t know how to climb stairs. “I guess, with feet that big, you probably can”, he said after I showed him I could. I already saw the room upstairs so I didn’t feel like going all the way up. Speaking of upstairs, I understand that this is basically a gardening blog, and so I have to talk about that for a minute. It helps me take a nap if I talk about that, some. It’s not very interesting to me; right now, anyway. So then just recently he decided to try “chipping” the seed, which involves a watchmaker’s loupe and a razor blade (which I’m not allowed to play with), and the seed germinates in, well, as long as I’ve been here. Hardly any time at all. Okay, well, that was boring. I think I’m beginning to like the guy who brought me here, and he seems happy with me, though he has some sad moments too. Someone else lived here who would have loved me, he says. I heard him make an appointment for me this afternoon, which I don’t like to think about, and he did stick me in the big new fort he bought, which you can see in the first pictures of me, so he could sleep a little (because of the four in the morning business), but after the sun came up and it got kind of warm outside, we both went out in the back, and if you haven’t seen this blog before, you would never guess what was out there. I found a honey locust pod. The guy who brought me here said all the border collies who’ve lived here have enjoyed snacking on them. Then I looked around more. I ran through the snow; it was really excellent. But mostly I surveyed my new territory. The guy who brought me here says he’ll put a fence around the plants that could stick me. I think that’s a nice idea. I’ll eventually learn to avoid them, because all the other purebred border collies who’ve lived here have. We’re all different, but in some ways all alike, if you know what I mean. My yard goes all the way to the back. I guess I should stop now. I wasn’t hugely happy being dragged away from home last night, but I think I’m going to like it here. Welcome Mani! You are indeed adorable, but it sounds like you know that. Is Mani short for something? Anyway, you may not realize it yet but you have “landed” in SUCH a good place! And Spring is just around the corner too. Excelsior! Thanks; no, mani is Sanskrit for “jewel”, or “precious stone”, and it’s a boy’s name (despite what the guy who brought me here was told). He was originally thinking he would get a girl dog and name her that, until he discovered the word was masculine in Sanskrit. It does seem like a pretty good place. I haven’t fully explored it yet, because I get sleepy. I’m already good at taking naps. Settling into a new place takes guts! 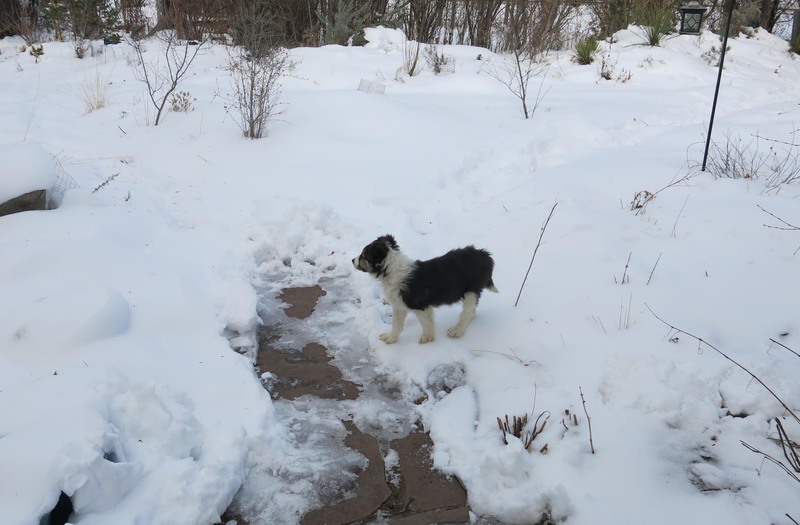 Mani–you are one brave little purebred border collie! If I told you how many new friends you have made by the simple act of putting paw to keyboard you wouldn’t even be able to begin to believe it, so I’m not going to go into it. The guy who brought you to this new place will be a wonderful friend to you–trust me on this. Please tell him, if you get the chance, that my grammy sends him the most warmest of best wishes. Thanks, kiddo! Thanks; I think it’s going to be okay here. I tinkled on the carpet and I didn’t hear a word. I understand that there will be some training, at a later date. So happy for you, Mani. The guy who brought you there is a great guy. You’re going to be a Very Happy Boy. Dear Mani, What a handsome fellow you are! And not just a pretty face, you are smart too (though having a part border collie I certainly know that). For a young fellow, you are doing a great job training your human–up at four in the morning–great place to start. Keep up the good work, it sounds like this human might be worth all the work you put into teaching him. Thanks; I thought the four in the morning thing was pretty funny. He just got up and got dressed, and I had breakfast. Very excellent. Or, wait, it was pre-breakfast. I had regular breakfast later. “Mani” also means “peanut” in Spanish, which is kind of precious, too. “Peanut” is certainly better than “Keith”, for sure. I mean not the name itself, but, well, I think you know what I mean. Well, “Peanut” is more wholesome than Keith, he of the eye-liner, for sure – so the young pup has that going for him. Yes, Peanut is better, in this case. Though being named after Keith Richards might be cool. If unoriginal. Small point of fact, very small…but the name of the eye-linered dude is, properly, “Keef”. And, having seen your innocent glowing tiny sweetness, I think calling you “Keith Richards” is hilarious. Thanks; well, if I got called Keef, someone might mistake it for “kif”, or “kief”, and that’s okay here, I understand, but in other places some linered eyes might widen. I’m glad you are starting to settle in Mani. I know how unpleasant it is to get sick in cars (I used to do that when I was little, but I’m OK now). It must be very tiring as well having to train the guy who brought you there, but I’m sure you’ll manage just fine – after another nap. Thanks; the guy who brought me here used to get car sick too, when he was little. “Nothing like car exhaust and cigarette smoke to help carsickness”, he says. I didn’t have to deal with either, but it was a really long drive, in the dark. Someone pulled out in front of us on the highway and slammed on their brakes, which wasn’t very nice, but my portable fort was seat-belted in, though I got jiggled some, and lost my lunch. Thanks; I do have needle sharp teeth. And plenty of stuff to chew, too. I just read about Chess. I’m so, so sorry. He was the best. Now Mani will fill your world with joy and dog hair and chewed things. Bless you. Welcome Mani! New life, new love, new home! You are one lucky pup! Thanks; I think I’m going to like it here, though I did discover there are rules about ripping up the kitchen floor. It needs to be replaced anyway, but, whatever. It’s your first human! I’m going to enjoy watching your adventures here! I’m glad you are settling in and sorry you got carsick. Many of your brothers and sisters have had the same experience their 1st car rides too. Tell the guy who came to get you that I love the pictures of you. It looks like you have a lovely newhome and a nice new human! Thanks for letting me come to this nice home. A lot. 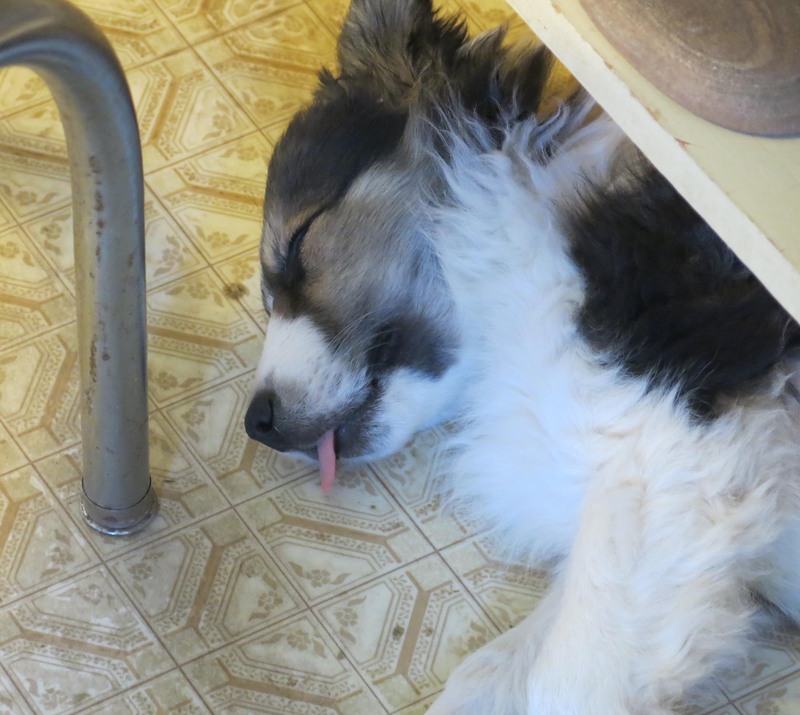 Sleeping with your tongue out qualifies you for both the smartest and cutest puppy of the day award! Beware of cactus, that’s my only advice. My tongue was out because I was dreaming of catching snowflakes. Puppy, you had me at “night light”. I think you have what it takes to rule the Chessdom and The Guy You Live With. And, oh yeah — all the rest of us, too. Have to have a night light. There’s also the humidifier that glows green and sometimes makes these funny gurgling noises. Like “uhny uftz”. He told me today that I balance out the sadness he feels at losing his old buddy, and that made me feel pretty good. Welcome. I think you’re going to like it there. 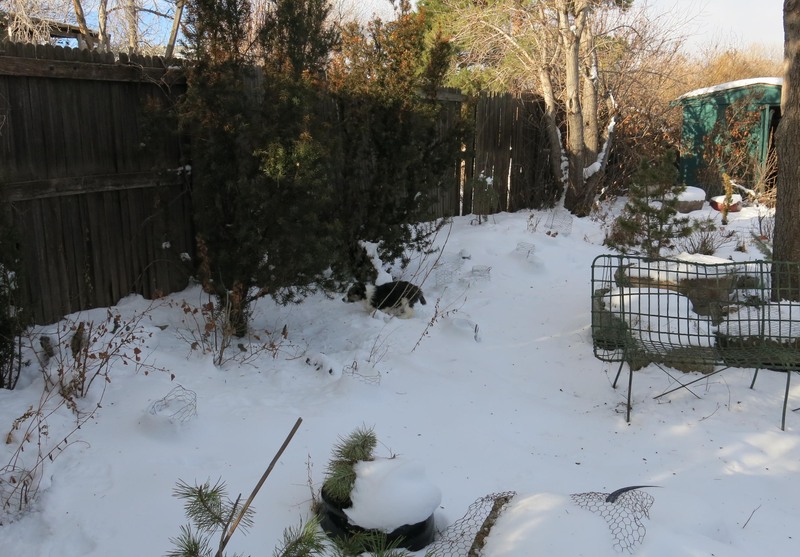 Brave of you to already be exploring the big snowy backyard! Thanks. I haven’t even gotten to the back of the back yard yet, and now it’s snowing again. I’m late to the “welcome” party because I was off at a concert. Keith wasn’t even playing. Now I’m one with this blog again, I say “Hi, little Mani.” You sure cutes the place up. 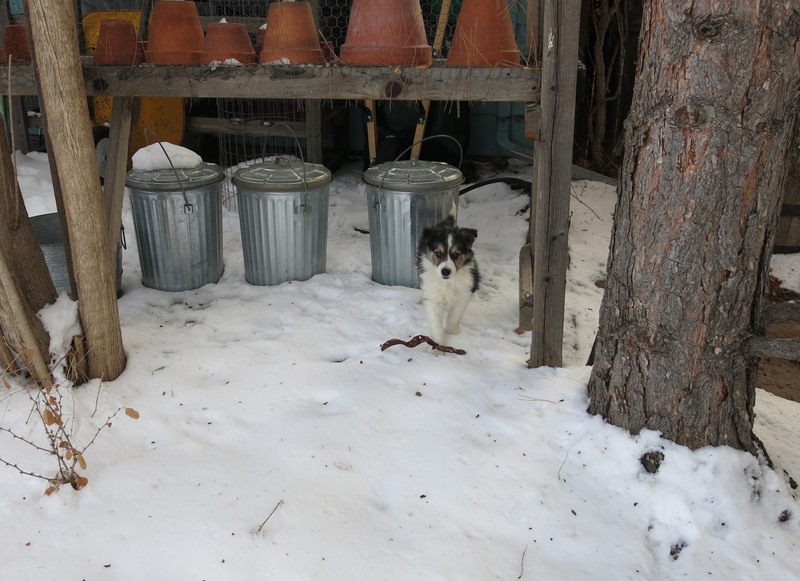 Doggie in the snow! hallelujah. I think for a bit all your new readers are going to have to remember this is a garden blog too. 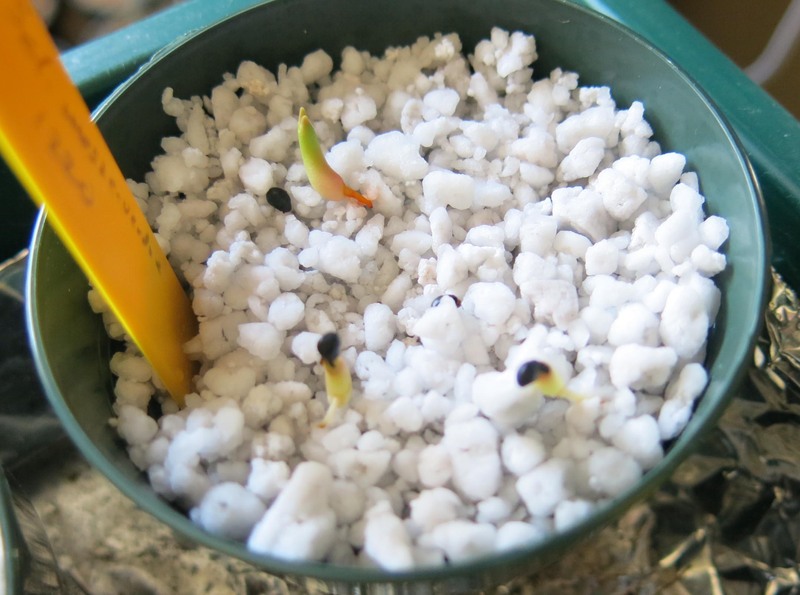 (Tell the guy you live with congrats on germinating Sclerocactus mesae-verdae after twenty-five years.) A nose question: your predecessor showed a cute pink nose which gradually darkened. Here you are, newly arrived, nose mucho black. Does this have to do with your tri coloring? I’m not sure you’re aware of this yet, so I am here to clue you in: any place with very few rules is a good place to live. Plus, you live with a guy wise enough to know puppy bladders are not developed enough early on to be trained. Although later ,,, you know that big backyard? A weedle spot exists somewhere in there and far, far away from stickie needles. You rule, adorable dog! and long may you. Thanks; well, I had an okay day until I was taken to the doctor which involved a car ride and well, you know, but the doctor thought I looked great and I have shot schedule now which sounds like something but I’m not sure what. Everyone there came out and looked at me and said how cute I was. I came back in the car, of course, and, well, you know. Then I got home. The Nature’s Miracle has been close at hand today, too. I won’t go into why. It turns out that some border collies start out with completely pink noses and they need sunscreen and stuff but eventually they become all black. The noses I mean. My Uncle Pooka, whom I never knew though I’ve heard about him now, had a completely pink nose, and it stayed pink, and stayed pink, and then eventually it got so black that his nose was completely pinkless, and so the guy who brought me home called him Pinkless instead of Pooka. Chess, the one who was here before me, and I can tell he was here, had piglet lips when he was born; pink lips with black spots, and so he was called Piglet Lips. Then just Piglitty. Only by one person in the house. I might become purple with white spots after a couple of years, the way he talks. Thanks. Well, I guess you know how excellent purebred border collies are. 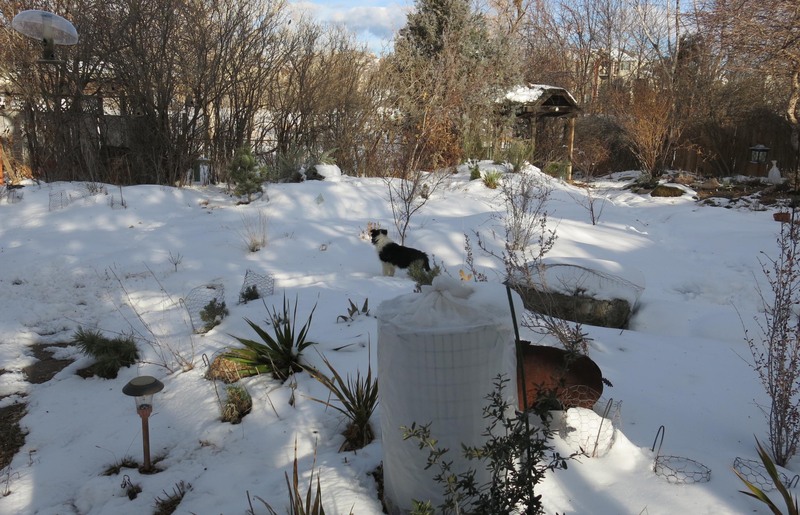 Check out the Border Collie Museum if you haven’t already. (bordercolliemuseum.org) The section on color types. It was really warm this morning when I got my pictures taken in the snow, but it got colder and is snowing now. Records amounts of snow for February. I have this idea that getting up at four in the morning will be met with protest tomorrow. Unless I agree to take a nap in my new big fort while he takes one on the couch in the afternoon. I haven’t signed anything like a Roommate Agreement so I may or may not agree. cute, you have the knack of showing cute. Excellent early days. Thanks; the way things are going here, it will soon be time for me to agree to everything complimentary. It was like, I was one of many, and now I’m the center of the universe. That seems to be something I’ll be able to deal with. So cute! And certainly the cactus germinated because you showed up, so obviously you are a great fit for the guy who brought you here’s garden blog. 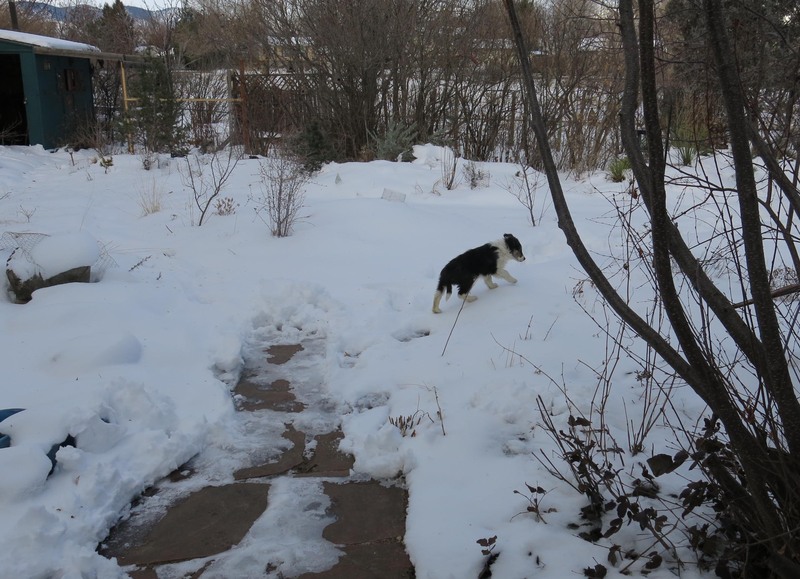 Enjoy exploring the way out back, and learning about all the wonderful border collie who came before you! Thanks. You know, even though I’m extremely little, I can smell more smells than any human ever could. I can tell there was a purebred border collie here just a while ago. Hello Mani. I know one should never assume anything, however, I am assuming that Mani is your kennel name and that your guy is going to give you another name or possibly just a nickname. 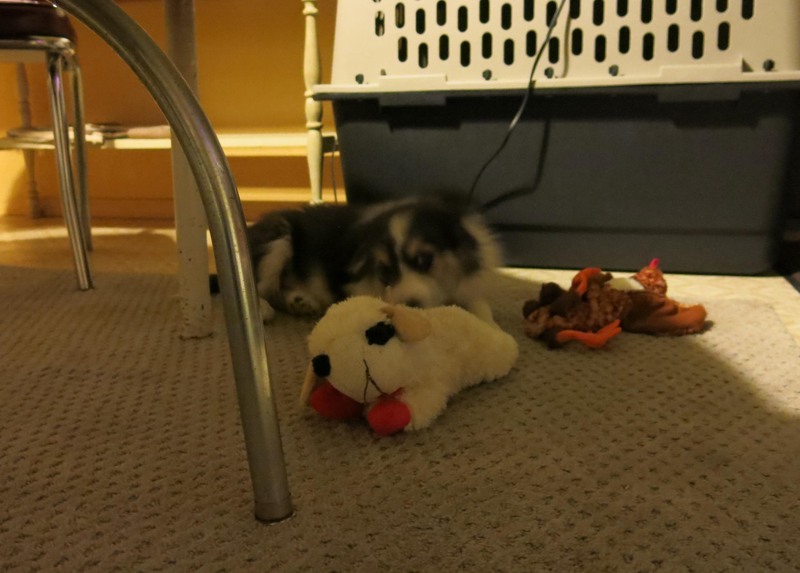 How lucky you found the toys, you must take care with Lamb Chops as it was the favorite toy of Chess. You are a very good model for cutsie photos, as Chess was. I especially like you in the snow looking very exploratory and also asleep with your tongue between your teeth. My best friend Chess the cat used to sleep like that a lot, he is not here anymore either. It sounds like you are settling in nicely and training your guy well. It won’t be long before he is describing all the plants growing in your garden to you so you can keep us up to date with what is happening in the garden. You are going to love it there, see you next time. ps. I used to bite my mum’s hands and ankles when I was a puppy. I think it was more to play as I always ate sticks in the garden which helped take the hurt out of my new teeth coming. For a couple of months her hands were shredded as she had to put them near the floor to feed me and pick things and of course to pat and love me. Hello; yes, my name is Mani, which was given to me by the guy I live with, which I guess I’ll call him now since I like it here a lot. What I really like, right now, is that I can be in my portable fort upstairs, with the humidifier making happy gurgling noise and my night light lighting, and cry and hootle and stuff, and he gets up and carries me down the kind-of-scary stairs, and get to have something to eat at two in the morning, even though he says he’s tired and it’s way too early, and I get my tummy tickled for waking him up, instead of him saying something. He’s says I’m kind of a baby which I guess is true. I have teeth. 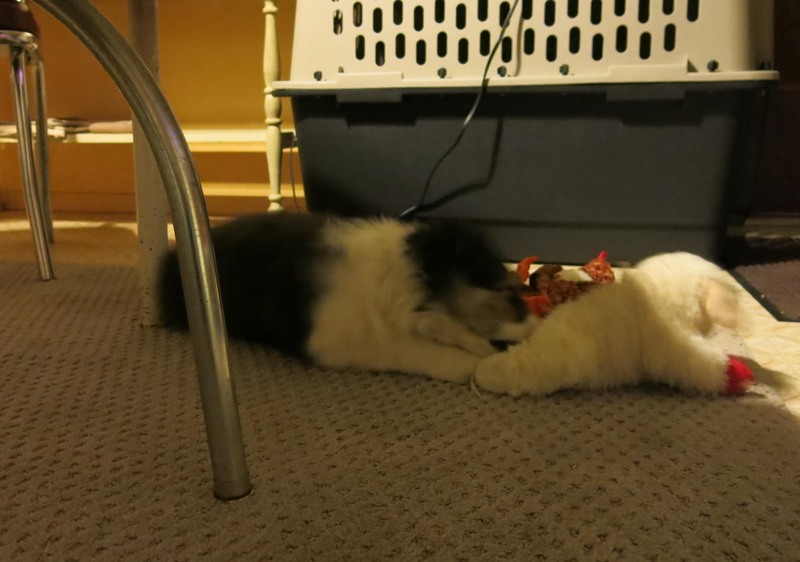 The guy I live with doesn’t mind having me chomp his fingers, because he says what I have are “baby teeth”, and it feels really good to bite into the toys I found here, but I do especially like Lamb Chop; in fact I love Lamb Chop, and I guess it’s mine now, which makes the guy I live with both very sad and very happy at the same time, which is kind of funny. Now, of course, that I got him up, to go get me something to eat, I’m going back to bed, until he tries to put me in my actual bed in the portable fort upstairs, and then I’ll pretend that being asleep was just make-believe, and I’m really totally wide awake at two in the morning, and so is he. Thanks; there used to be a lurcher living in the apartment complex to the north, but it must have moved away. i’m so happy you have such a beautiful and fun backyard!! and thanks for all the photos! you are so adorable! Thanks; yes, I kind of am adorable, aren’t I? I can already tell that the known world revolves, oh, pretty much completely around me. Oh my! I’ve just spent the last two weeks in the garden pulling weeds (California) and entirely missed saying good-bye to Chess. I know how hard it is; I said good-bye to my sweet Edgar last February. He was 12. Wouldn’t have traded a minute of those 12 years. I’m happy to say hello to little Mani, though. Very happy indeed to see little Mani! Thanks; I’m very glad to be here. 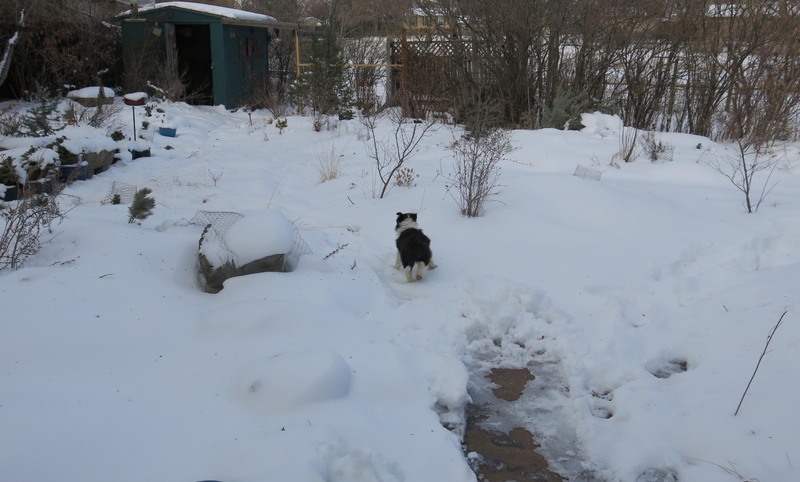 This is a nice place, and, being a purebred border collie, I need lots of attention, and there’s someone here pretty much all the time to attend to my every need. I think most people understand why I showed up so quickly. Aside from me being super totally hyper cute, I mean.